Where is my whisky stored? What protection measures are there for my whisky? How is access to my account secured? What is the Burglar Alarm? How can I be sure no-one will steal my whisky or money? What is "full legal ownership and title of physical whisky" in WhiskyInvestDirect? What happens to a bailment if a business fails? How do I check up on your records - to make sure they're sound? How do you keep my unspent money safe? Your whisky is held in the same bonded warehouses used by the Scotch whisky industry. You buy your whisky when it is already in the warehouse. Whisky is always insured and does not move. Even in the course of delivery from WhiskyInvestDirect seller to buyer the whisky stays securely in the warehouse. 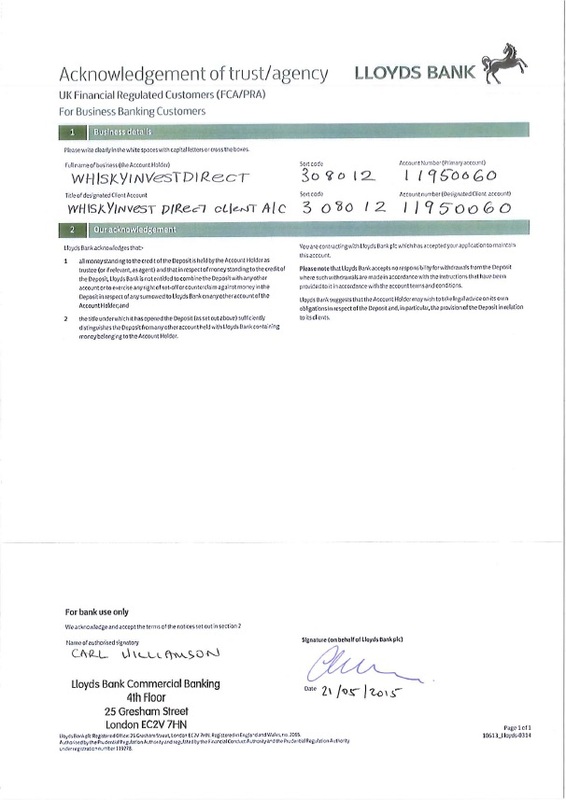 You can at any time prove your individual ownership of whisky in the warehouse by comparing the official cask list produced by the bonded warehouses used by WhiskyInvestDirect to an individually nicknamed list of all WhiskyInvestDirect holdings published on a public page on the WhiskyInvestDirect website. In the warehouse your whisky is soundly protected. Access to your account is protected with state of the art encryption technologies - but WhiskyInvestDirect is designed to allow account access to be compromised and still keep your property safe. You can at any time monitor WhiskyInvestDirect records to prove they correctly assign your stored whisky to you. When stored in the same warehouses used by the industry, whisky is extremely easy to insure, and not expensive. The evidence of that insurance is available to be viewed on the website. The cost is included in your custody charge. Your account is protected by some of the most secure cryptographic methods ever devised. These are widely recognised as offering a thoroughly secure means of data communication and are the technical protocols in wide use by banks, governments, and other highly secure users of the internet. But we do not accept that the ciphers could not in future be broken, or your passwords found out. Because of these very real risks WhiskyInvestDirect has assumed that against the odds your internet access will be compromised, and we have implemented substantial further safeguards to guard against such an eventuality so as to still keep your whisky and your money safe. When certain events occur on your account, WhiskyInvestDirect can send an SMS message to your mobile/cell phone to keep you immediately informed. We call this the 'burglar alarm'. It allows you to monitor your account even when you aren't near a computer. You can set up your mobile/cell phone number and enable/disable the optional messages from the ACCOUNT > SETTINGS page. Note: Your phone number must be entered in full international form for these messages to reach you. For example: +44 7555 123 456. There is a nominal charge for the optional messages. Please see our tariff for details. Even if someone broke through your account security, and your burglar alarm, there is a final failsafe security measure - the restriction on the destination of withdrawals from your account. In normal circumstances [see exceptions] we only allow money which might be raised on your WhiskyInvestDirect account (i.e. by selling your whisky at the market price) to be returned to the bank which originally funded your WhiskyInvestDirect account - i.e. yours. It would be inconvenient for you, but not catastrophic - and because the criminal would not profit there is little incentive to go to the effort and risk the consequences of detection. This is a failsafe characteristic which provides you with considerably greater security than is possible from your bank. After all, your bank probably has to effect payment on your behalf to hundreds of different places in the banking system. It cannot switch them off and still be useful to you. We on the other hand can switch them all off, and we are much more secure for you because of it. What does it mean to have "full legal ownership and title of physical whisky" in WhiskyInvestDirect? Ownership of your whisky in WhiskyInvestDirect is outright. WhiskyInvestDirect whisky is not subject to a trust deed, and it is not anyone's liability. It is - quite simply - your outright property from the instant you buy it to the instant you sell it. In accepting the WhiskyInvestDirect Terms of Business you have engaged WhiskyInvestDirect as a custodian of your whisky. WhiskyInvestDirect has subcontracted the physical custody of your whisky to the warehouse operators. WhiskyInvestDirect has retained responsibility for administration and record keeping, which is performed through the WhiskyInvestDirect website. You can see the official cask lists on the WhiskyInvestDirect website, and reconcile them to the WhiskyInvestDirect customer-by-customer records. You should also know that in their agreements with WhiskyInvestDirect the warehouse operators fully acknowledge that the whisky shall remain the property of WhiskyInvestDirect clients at all times. These are unusually strong property rights for you because there is no intermediation via trusts or company balance sheets. The whisky is your personal property and is treated under English law as a "bailment". In English law a "bailment" occurs when a person [the bailor] delivers physical property into the possession of another person [the bailee] on condition that the goods are either returned to the bailor at some later agreed date, or disposed of in accordance with the bailor's instructions. The essence of a bailment is that the bailee [a custodian] has physical custody of goods but they remain the outright property of the bailor [you]. The bailment is founded on old and well established trade laws. Ancient courts decided that transferring goods to a custodian did not grant a property right to the custodian, or to its creditors in the event of the custodian's failure. Instead the property remains that of the original owner until it is delivered according to the bailor's [your] instruction. Failing successful onward delivery the property would be returned in full to the bailor [you]. If you've not heard of a bailment it's because they are now uncommon - especially in the investment world. In law a bailment is restricted to physical goods which can be owned outright through possession. A bailment cannot apply to entitlements evidenced by stock certificates, trust deeds, unallocated accounts, futures or other bookkeeping entries. With these the possession of a piece of paper does not grant the basic property right, because the actual value of what is owned is abstracted from the paper itself. So bailments - and the outright property rights they confer - are not widely applicable to modern securities like stocks and shares. Instead modern securities law is based on contracts, trusts, deeds and increasingly complex case law. All of these constructions are far more complicated than owning some physical material. Indeed key clauses in contractual and trust agreements are frequently struck out by the courts, which insist on their right to interpret complex documentation and its wider legal meaning. There is simply not the same potential for future argument with a bailment of physical goods. It remains the legal property of the bailor [you] and this inalienable property right is soundly established and tested in law. Over several centuries there is very much less case law on the subject of custody bailments than on the subject of trusts, because there is much, much less to argue about than with a trust or deed. Owning your whisky in this way gives you the soundest protection from business failure. When businesses fail liquidators are appointed to take control of the company's assets, sell them and arrange a fair distribution to creditors of various classes including themselves. Liquidators generally claim ownership of every asset on a failed company's balance sheet. However they cannot lawfully treat bailments as the property of the company available for creditors' benefit. Should they try to do so any dispute would be resolved - perhaps even in court - by reference to several key pieces of evidence. The first is a clear documentary statement about who owns the bailed goods. This is stated in WhiskyInvestDirect's Terms and Conditions here, and it is unequivocally you. That fact is also evidenced on the contract between WhiskyInvestDirect and the warehouse operators. The second is the company's balance sheet. This is a public document where the assets belonging to the company are annually listed and filed at Companies House. Creditors are entitled to expect that assets listed on the balance sheet protect them from a company's insolvency. But your whisky does not belong to WhiskyInvestDirect and has never been on WhiskyInvestDirect's balance sheet. No creditor of the company can claim to rely for protection on whisky which the company never claimed as an asset. The third is the fact of your payment for a custody service. This is evidence that the whisky is your property in WhiskyInvestDirect's safekeeping. It evidences the nature of the agreement - i.e. that you are paying for the protection of your property, and not transferring your property to WhiskyInvestDirect for gain. The custody fee is deducted from your cash balance and posted monthly to your statement. Once a month, WhiskyInvestDirect publishes the proof of your ownership on-line. You'll see your own public nickname on this reconciliation, right next to your whisky or cash balance. The total balance for each line of whisky can be matched to the cask list linked at the top of the page. All the cask lists clearly state that the whisky is owned by "WhiskyInvestDirect Clients c/o WhiskyInvestDirect Ltd". This proves that your whisky is held independently of us by our warehouse operators. WhiskyInvestDirect is the only whisky business in the world which publishes a regular proof to independent third party documents. It is the most transparent public scrutiny policy you will find anywhere on Earth. But we want you to be 100% confident in WhiskyInvestDirect records, so our own Audit is checked annually by external auditors - Albert Goodman. They examine our procedures, confirm our arithmetic, check that the warehouse operators issued the cask lists and check that the bank issued the bank statements. You can check up on Albert Goodman themselves at the website of the Institute of Chartered Accountants for England and Wales. Taking the WhiskyInvestDirect commitment to record keeping transparency, together with the burglar alarm, the integrity of our warehouses, our insurance arrangements, the single route out for your money, and other elements of our security features, we believe we have produced the safest environment on Earth for our customers to store their maturing whisky. Your uninvested money is held in segregated and pooled trust accounts designated 'CLIENT' at Lloyds Bank or Wells Fargo. Under English law a bank may not consider the money in a trust account designated 'CLIENT' to be offset against debts which WhiskyInvestDirect might incur in running its business. You can view a copy of our bank account trust deed here.